I've taken all 110 Messier Objects in the last year. Just finished the last the other night. Put into two posters. 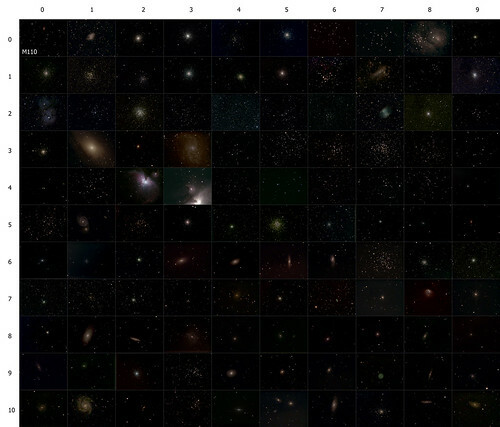 The first is Messier 1-50 (had to resize to make small) to post here. Will post M51-110 if this works ok.
Also have these on a web page with a little slide show. Images were all taken from my Driveway in Central West Virginia. Mount is Atlas EQ-G, used two scopes, ED80, and 11" SCT. One used to guide, the other to image depending on the FOV required for the object. Exposure times vaied from 30 second subs for some clusters (10 minutes total), to several hours for some larger Nebula and fainter galaxies. Guide camera was Starshoot 1 with 0.5 focal reducer. Imaging camera was Rebel Modified for all objects except M1 and M94 (Starshoot was used for there). Guiding software was PHD, images acquired and processed with Nebulosity. Resized and touched up with Elements 5.0. The image quality on the screen is not too great due to the size limitation of 105K file limit, but you get the idea. I was mostly limited by weather over the last year since it rains al lot here. Also, I had to waituntill now to catch a glimpse of M68 and M83, the last 2 to fall. Each image was taken using a Meade DSI II Color attached to an LXD75 SN-8 and consists of 15 x 15s images stacked in Envisage and leveled in Photoshop. I don't know how you guys even find these, i know where to look and it should be dark enough to see them through my 6" reflector but i can't find any M objects. I'll post this in the beginner section as well, that's maybe more effective. Ed Sunder, that's sick what you did! Edited by kosmosoved, 06 September 2015 - 08:20 AM.